Deteriorating quality of education in public institutions poses a serious threat to the Indian youth of today and tomorrow. As it directly affects about 65-70% of the students – those who use publicly funded institutions – it is imperative for them to question the political leaders in their constituencies, especially now when the electoral battle has just begun. Moreover, even though the rest – roughly 30% of students – do not have a direct stake in these institutions, they should be equally perturbed as they pay taxes and a poorly educated workforce is a national loss of human productivity. Teacher absenteeism accounts for the loss of up to one-quarter of primary school spending. A World Bank Report estimates this loss to be about $2 billion a year in India, just at the primary level. Absenteeism of teachers at all levels in government institutions hurts students from disadvantaged backgrounds the most, as schools and colleges are the only avenue for their social and economic advancement. Reduction in teaching time negatively influences the overall quality of education. Moreover, this is a problem that can be tackled with political will of local leaders. Deterioration of quality in publicly funded educational institutions is a serious issue and definitely calls for a greater public push. The same set of political leaders who bring up employment or underemployment, hardly ever talk about the deteriorating education system. This discrepancy is even more glaring as the same set of netas are interested in campus politics and engaging youths in their election campaigns. They do not, however, take interest in improving the quality of education on the same campuses. 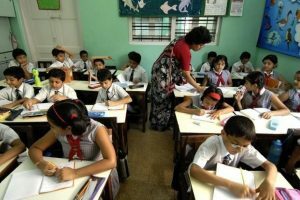 There are two general arguments regarding the cold attitude of netas to public education. Firstly, they do not have any stake in the system as many of them send their wards to private schools and colleges. Secondly, some of them do not want their constituents to get educated so that they remain under their influence. Thus, youth easily fall into a trap between the politics of employment and the politics of campuses. Some of these students are so naive that they do not even understand the difference between the life they enjoy in public institutions due to subsidy and life post-education, which is very competitive. Due to prevailing job insecurity, youth also prefer to hear more about employment than the existing problems in state funded education. Possibly, many of them care for their degrees rather than the learning. Hence they lose their most important formative years, when they are still students and have opportunity to learn and prepare themselves for the job market. With general election round the corner, this is an important time for students to challenge candidates to make education their first priority in election manifestoes and speeches. With a median age of 27.9 years in 2018, India’s population is quite young. By 2020, youth will make up 34% of India’s population. Forty-five million young people have been added to the voters list since 2014 and they can play a critical role in 2019 general election. Based on 2011 Census, about two crore youngsters turn 18 every year, even though not everyone gets registered as a voter. No political party can afford to overlook this cohort. They can actually use their collective strength to push candidates to make education a priority in their constituencies. Those from state funded institutes compete for jobs with the students who attend private educational institutions. In the absence of a level playing field, majority of students will succumb to the competition. Many of them struggle throughout their lives due to absence of good education for 20-22 years during their formative years. Citizens must push politicians at each level to get their commitment to fix publicly funded educational institutions in their area. Political leaders have tremendous potential for mobilising resources and fixing local problems. Why can’t they fix a few educational institutions in their respective parliamentary constituencies? They can stop absenteeism; ensure parent-teacher meetings; mobilise alumni and local people to contribute towards extra-curricular activities and special lectures on important issues; ensure proper use of funding by the institutions; mobilise resources to upgrade and maintain facilities such as libraries, toilets, computers and so forth. All these do not require large funds and can be taken up with strong political will. Education does not deliver results quickly and hence the results might not be visible in the years between elections, but such engagement would certainly show positive progress. Politicians would have a better grip over the young voters, if they genuinely work towards turning around the educational institutions. On the other hand, being the prime stakeholder of a deteriorating educational system, students will have to come forward and stop following the politicians on the basis of caste, religion and other such affiliations. No affiliation works when they start applying for jobs, when they actually compete with students who are better qualified and have better skills. It is mostly merit which works in jobs and growth within the chosen career. No other time is more suitable than the current election, when students can start questioning netas about their plans to improve education. Or else, parties will continue deceiving the youth by promising jobs and employment growth, while not doing anything about preparing them well for employment and self-employment. For every young voter of today and tomorrow, a good quality education could be the most empowering and liberating tool. The rest will follow. 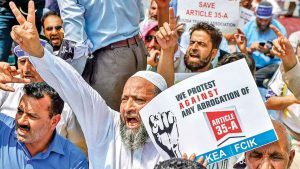 The latest controversy about Jammu and Kashmir (J&K) over Article 35A of the Constitution is wholly avoidable and fails to advance the public interest at this juncture. These provisions stem from the special circumstances under which J&K became a part of the Indian Union and the legal expression the Constituent Assembly of India chose to give them. Their abrogation by Parliament, without regard to the opinions and sentiments of the people of the state, as demanded by some sections, will further degrade an already fraught political situation within the state. Nor is J&K only state to have special provisions of exclusivity attached to it. Article 35A gives the J&K legislature the right to decide who are the state’s ‘permanent residents’ and thus entitled to special rights over jobs, residence and the right to buy and sell land and property. This is achieved by granting the state’s laws on the subject immunity from being rendered invalid on the ground that these are inconsistent with other parts of the Constitution of India. There was nothing surreptitious about 35A. It was introduced via an order of the President of India under Article 370, which had been debated at length in the Constituent Assembly, which contained quite a few luminaries such as B R Ambedkar, besides Jawaharlal Nehru. The laws within J&K are iniquitous towards women, especially those who marry non-Kashmiris. These and similar laws elsewhere should go, but not necessarily by external fiat. ‘Tribal’ areas in four northeastern states are governed by the Sixth Schedule of the Constitution, to protect local interests, and the Fifth Schedule applies to tribal areas of 10 states. All these exceptions were made after understanding the great complexity of India and its peoples, where one size fits none. उनका यह अभियान संकीर्ण स्वार्थों से प्रेरित है, इसका सबसे बड़ा प्रमाण यह है कि करीब चार महीने पहले ही कांग्रेस ने तीन राज्यों में भाजपा को पराजित किया है। इसके पहले भी उसने गुजरात में उल्लेखनीय जीत हासिल की थी। तथ्य यह भी है कि अतीत में दिल्ली, बिहार, पंजाब आदि के चुनाव नतीजे भी ईवीएम से ही निकले थे और उनमें भाजपा की हार हुई थी। इसी तरह 2004 और 2009 के लोकसभा चुनावों के नतीजे भी ईवीएम आधारित थे। आखिर बीते दो-तीन साल में ऐसा क्या हुआ है कि ईवीएम को बदनाम करने का सिलसिला कायम हो गया है? हैरत नहीं कि कुछ दिनों बाद राजनीतिक दल यह मांग करने लगें कि शत प्रतिशत मतदान पर्चियों का मिलान ईवीएम से किया जाए। ध्यान रहे कि कुछ दल ईवीएम के बजाय बैलट पेपर से मतदान की मांग कर रहे है। यह कुछ वैसी ही विचित्र मांग है जैसे कोई ट्रेन दुर्घटनाओं का जिक्र करते हुए बैलगाड़ी से यात्रा को बेहतर बताए। 50 प्रतिशत मतदान पर्चियों का मिलान ईवीएम से करने की मांग इसलिए अनावश्यक है, क्योंकि निर्वाचन आयोग करीब-करीब हर विधानसभा क्षेत्र के एक बूथ की मतदान पर्चियों का मिलान करता है। अभी तक इसमें कोई गड़बड़ी नहीं पाई गई है। आखिर जब इस व्यवस्था में कोई विसंगति नहीं मिली तब फिर 50 प्रतिशत मतदान पर्चियों के मिलान की मांग का क्या मतलब? यह सही है कि सुप्रीम कोर्ट को याचिकाओं का निपटारा करना ही होता है, लेकिन उसे यह भी देखना चाहिए कि याचिकाकर्ताओं का मूल मकसद क्या है? सभी राजनीतिक दल अपने घोषणापत्रों को अंतिम रूप देने में जुटे हुए हैं। मीडिया में बहस जारी है कि इन आम चुनावों के निर्णायक मुद्दे क्या होंगे? अभी तक जिन मुद्दों को मीडिया में और चुनावी सभाओं में उठाया गया है, वे राष्ट्रीय सुरक्षा, भ्रष्टाचार, बेरोजगारी, कृषि संकट और गरीबी से जुडे़ हुए हैं। इस समूचे राजनीतिक विमर्श से शिक्षा, स्वास्थ्य, लैंगिक समानता और मानव विकास से जुड़े तमाम मुद्दे एक सिरे से गायब हैं। हर बार की तरह इस बार भी घोषणापत्रों में शिक्षा, स्वास्थ्य और मानव विकास से जुड़े कुछ बिंदुओं का जिक्र, मुख्य मुद्दे के रूप में न होकर, हाशिये के मुद्दे के रूप में सीमित रहेगा। क्या भारतीय लोकतंत्र के लिए शिक्षा चुनावी घोषणापत्रों में सिर्फ उल्लेख करने लायक मुद्दा रह गया है? सभी राष्ट्रीय व क्षेत्रीय दलों से यह उम्मीद की जानी चाहिए कि वे स्पष्ट करें कि उनके अनुसार अगले 20 वर्षों के लिए अच्छी क्वालिटी की शिक्षा समाज के हर वर्ग को कैसे सुलभ कराई जा सकेगी? 1966 में भारत सरकार द्वारा नई शिक्षा नीति बनाने के लिए गठित कोठारी कमीशन ने सुझाव दिया था कि देश 1986 तक शिक्षा पर जीएनपी का छह प्रतिशत खर्च करे। 52 वर्षों बाद अभी तक यह खर्च जीएनपी के 3़.5 प्रतिशत तक पहुंच पाया है। क्या अगले तीन वर्षों में हम इस लक्ष्य को पूरा कर सकते हैं? The former governor of the RBI, Raghuram Rajan, has reignited the debate on the autonomy or independence of the country’s central bank by suggesting that it was perhaps an opportune time to set statutory limits to protect the term of the governor. In an interview to ‘The Indian Express’ last week, he said that imposing checks on the government’s powers was important to secure operational independence and to put an end to constant interference by the sovereign, to achieve the broader objective of price and financial stability. The former RBI chief’s remarks appear to have been framed in the context of the exit late last year of Urjit Patel, well before the end of his term, after a spat with the government, as well as his own uneasy relationship during his three-year tenure. Ultimately, as the first Indian governor of the RBI, CD Deshmukh, said seven decades ago, it is not the constitution of the institution that matters, but the spirit in which the partnership between the ministry of finance and the bank is worked. And that the success of the partnership will, in the final analysis, depend on the manner in which the government asks to be served and provides opportunities accordingly. It is the display of such a spirit by any government that will be critical to the future of India’s public institutions, including the RBI. When the tsunami hit the Andaman and Nicobar Islands in 2004, thousands perished. However, some of the oldest Adivasi tribes, the Jarawas and the Onges, lost nobody. These communities followed animals to the highlands well before the waves hit. Formal education was of little survival value in a context where you needed swift instincts. When Western drug and pharma corporations send their scouts to remote regions in India to look for herbs to patent, the scouts do not consult top Indian doctors or scientists first. They smuggle their way into jungles inhabited by Adivasis where, in a moment of weakness, an elderly woman adept in the healing arts may divulge a secret or two. Later, the companies might test the herb in their labs and find that the woman’s claims were correct. This has long been the staple of biopiracy. That those forests inhabited by Adivasis are some of the best conserved in the subcontinent is a long-standing fact contrary to the understanding of supposedly educated Indians. What is invaluable is what is often described as ‘indigenous knowledge’ — as though the knowledge gained over centuries of lived experience is of somehow lower valency than the literacy acquired in a school, or perhaps of no value at all. Sadly, the articulate arrogance of ‘New India’ is such that it is unable to see any virtue in the lives of Adivasis and other forest-dwellers who have lived in and by the forests since times immemorial. Ensconced as it is in the air-conditioned offices of metropolitan India, duly estranged from any living ecology of the earth, while fully predatory on it, it sees people who live in and by the jungles as ‘underdeveloped’ criminals who are among those responsible for the thinning of the forests. This appears to be the view held by petitioners, including retired forest officers and conservation NGOs, in a lawsuit filed in the Supreme Court in 2008. They seem to believe that humans are not a part of nature and can never coexist with it. It is far from their imagination to distinguish between Adivasis who know something about living sensibly with nature and the rest of us, who do not. That even the courts would fall to such abysmal levels of understanding has become a defining feature of the reforms era. On February 13, the Supreme Court ruled that over 1.12 million households from 17 States, who have had their claims rejected under the Forest Rights Act (FRA) 2006, are to be evicted by the State governments before July 27. It is not clear what fraction of these are individual claims and what fraction are community claims. Nor are all of these Adivasi households. Some might fall under the ‘other traditional forest-dwellers’ category. Critically, the Central government failed to send its attorney to the court. Ironically, the FRA contains no legal provision for the eviction of rejected claimants. In the face of loud protests from around the country, the court issued a stay order (till July 10) on its ruling. This suits the political goals of the incumbent BJP as it prepares for the polls. Many States are yet to give their details to the courts. Once they do, the number of households to be evicted may rise. Close to 8-10% of the Adivasi population may be asked to vacate their traditional homes and abandon their livelihoods. Has the court contemplated the gravity of the implications? Where are these people supposed to live and make a living? What justice is there in acting in such an inhumane manner? It betrays ignorance. The judges know that we live in an ecologically imperilled time when metropolitan India has much to answer for its corporate-consumer excesses. And yet, it is among the weakest and the wisest that they choose to attack. The world’s largest refinery is coming up in the Konkan, uprooting 17 villages, over half a million cashew trees and over a million mango trees. Thousands of acres of Himalayan forests and over a hundred villages will be submerged by one of the world’s tallest dams coming up in Pancheshwar in Uttarakhand. Are the conservationist petitioners and courts doing anything to stop any of this? They show little courage when it comes to tackling the land mafias, builder-developers, realtors, constructors and miners, but their conscience is ablaze over conserving Adivasis in the jungles. This is the arrogance of ignorant India and it shall not abdicate till it has laid to rest the last hopes of what was ‘a wounded civilisation’, and is now a dying one. For, let us be clear about one thing: freeing the forests of their traditional inhabitants is almost certain to expose their erstwhile habitats in short order to the speedy, organised depredations of the forces of what has come to be seen by the elites as ‘development’. If remote habitats are emptied of Adivasis, there may be nobody to forewarn us when ecologically perilous tipping points are crossed in the future. To make matters worse, worrying amendments that have been proposed to the Indian Forest Act, 1927, which further strengthen the stranglehold of forest officials over India’s jungles and its inhabitants, have now been made public.